The best recipes always have a story. Don't you agree? Some are stories passed down from generation to generation. Some are of a special place, or time. It always seems that, more often then not, my families favorite recipes have come from some sort of mishap or misstep of mine. They all swear that the recipes really are the best, but I sometimes think they just like having a giggle at my expense. I don't mind providing a bit of comic relief. I guess it is like a meal plus entertainment all rolled into one. Case in point, the inspiration for this dish. 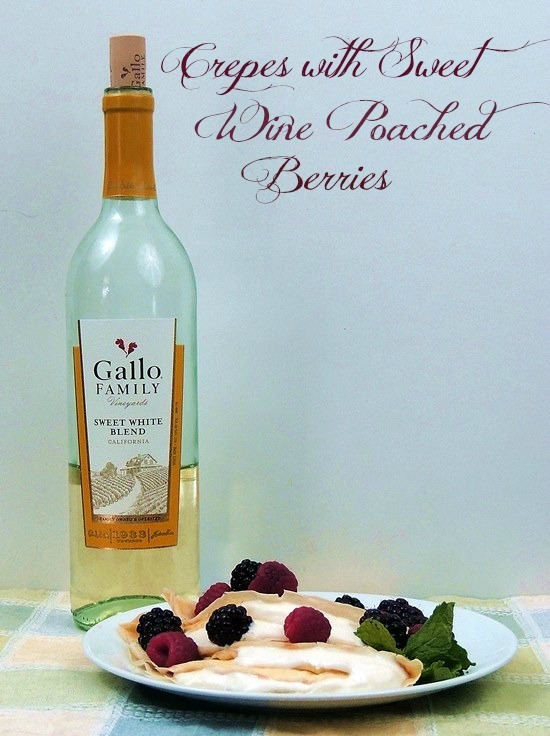 When I was chosen to participate in this weeks Sunday Supper with Gallo Family Vineyards, I found out that I would be receiving a bottle of their fabulous Merlot, as well as a bottle of their Sweet White Blend. I began thinking about which wine I would like to use. I thought about making a hearty rich stew or pasta with the Merlot. Those are always winners in my book. But, for some reason, as soon as I looked at that bottle of sweet wine I knew I had to make these crepes. Because I have had such success with crepes in the past? Uuumm nope, I have failed miserably every time I have tried to make them. Because I have experience with poaching berries in wine? Well, you could say that. The first time I tried poaching berries in wine I was poaching strawberries in champagne. I poached the berries and then poured them along with the poaching liquid into, what I thought was, a heat resistant bowl and popped into my refrigerator to chill. A few hours later I opened the fridge to remove the properly chilled berries and complete my dish. As soon as I opened the door I was greeted by walls and shelves covered in bright red liquid and berry shrapnel. After closer inspection I realized that my need for speed was my downfall. Due to the hot liquid + the cold fridge, the entire side of the bowl literally blew out and made the inside of my refrigerator look like a murder scene. My family sure got a kick out of watching me clean every square inch of my refrigerator as they nibbled on the champagne poached strawberries that were spared a gory demise. So a success? Not so much. But this bottle of wine just told me that I needed to take these two negatives and make a positive. Call me a glutton for punishment if you will, but I was determined to take make the vision in my head a reality. Well, the Gallo Wine Gods were with me on this one gang. It was perfect!! I am no longer crepe challenged. Now my family has just one more recipe with a story. I hope you give this wonderful dish a try!! Place berries in a bowl. In a medium saucepan, heat wine and 1/4 cup sugar to boiling. Remove from heat and pour over the berries, making sure they are completely covered with wine. Allow to cool at room temperature, then cover with plastic wrap and refrigerate for at least 2 hours (can be done the night before). In a small bowl, combine the mascarpone cheese, Greek yogurt, and remaining 3 tablespoons of sugar. Set aside. In a blender, combine the eggs, milk, water, flour, and melted butter. Pulse until blended. Place the crepe batter in the refrigerator for 1 hour to allow the bubbles to subside. The batter will keep for up to 48 hours. To assemble, lay crepe flat on plate. Spread some of the mascarpone cheese mixture onto half of the crepe. Fold the other half over the top and then fold in half again. Top with berries. Need to find a retailer near you, click here. You can also visit Gallo’s website or connect with via Facebook, Twitter, Instagram, or YouTube. Now check out the other fabulous dishes from the Sunday Supper family! So glad you kept trying crepes and was successful with these. They are perfect for brunch. We sure loved them. Kevin is already requesting them again! I think you've mastered crepes as these look sublime!!! LOL at the refrigerator disaster, but I'm certain it wasn't funny at the time!!! Your crepes look lovely! I'm glad that the poached berries went better this time as well. They sound amazing and I think I have just enough left in my bottle of sweet white blend to make them. Oh do it Heather! You will love them! so glad that you attempted crepes again!!! and WOW, these are beautiful and perfect! delicious! First- these look delicious! I like that you decided to poach the berries in the sweet white; what a great idea! And I definitely am giggling a little bit at the image of the craziness in your fridge...I hate when things like that happen! Ya I live Murphy's Law in my kitchen! These look amazing to me! The Sweet White Blend is such a fantastic wine. It screams for berries to be poached in it. Pinning this recipe for later. I completely agree Shannon! I can't wait for you to give these a try. We STUFFED ourselves with them! I adore crepes and boy are these just gorgeous! You did a fantastic job with these photographs. I love berry crepes, but I never thought about poaching the fruit with wine! Great idea, Bobbi. Beautiful picture! Oh my gosh, Bobbi, I can't imagine what it took to clean that mess! But these look perfect. Wish I coul dig my fork right into my screen! Love crepes and these look mah-velous!!! Happy #SundaySupper! Your crepes look amazing! I've always wanted to try making them. Now I think I have to asap! Yes yes yes you do!! OMG, I can just imagine what a mess your fridge was! So glad you got it perfect this time. I want to grab a fork and dive right in! They are seriously addictive Lori! I couldn't stop eating!! Oh I HATE cleaning up messes in the fridge. But this story does make me feel better. This is totally something that would happen to me. And look what a great recipe you ended up getting out of the deal. These crepes look totally worth it. Oh my goodness! Please come make these in my kitchen right now! That crepe filling looks so decadent! It was! I could just eat it by the spoonful! Beautiful dish! I'm a big believer in having to learn things the hard way. Then you have good stories to tell! This dish looks and sounds wonderful! AND this is why you are a food blogger...gotta try try again until it's right! Yes, we a re a stubborn bunch aren't we?